Hi-Mound has been in business since just after World War II, and these well-made keys, paddles, and bugs have a well-deserved reputation for quality. "High Mound" is the closest English translation of the founder and President's name-- the late Mr. Takatsuka. 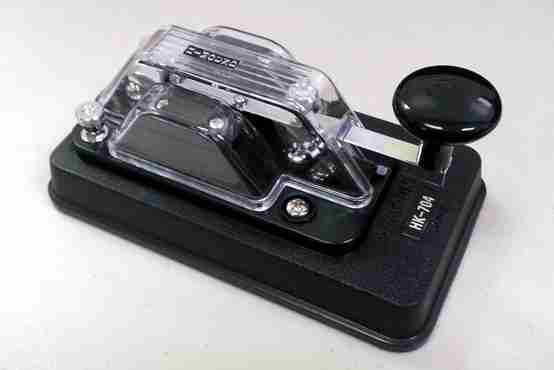 Hi-Mound's low profile straight keys are perfect for sending using the American style (forearm resting on the desk). They are well made and will last a liftime. 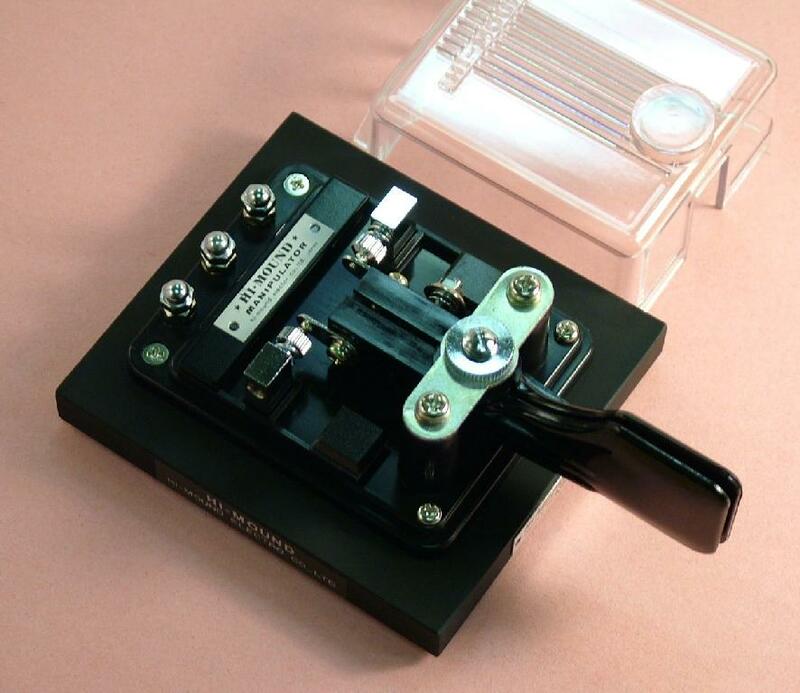 The contacts are machined hard silver, suitable even for high voltage tube rig key lines. and the bearings are permanently lubricated. They come with the flat 3/4" button, but you can replace that with the "mushroom knob with skirt" if you want more "grip." Base dimensions are approximately 6-3/8" long by 3" wide, and weight is bit over one pound. 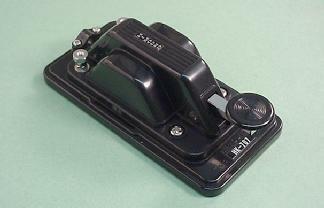 Note that even in the less expensive keys, the base extends underneath the knob. The result is that downward keying pressure is directed straight down through the base, and the key won't tip or rock-- no need to hold it with your other hand, or screw it onto something! "Little Brother" of the famous HK-708, the Model HK-705 is smaller, lighter, and less expensive. The design is virtually identical to the 708, but the 705 is only 5" inches long by 2-3/8" wide and weighs a mere 4.25 Oz. 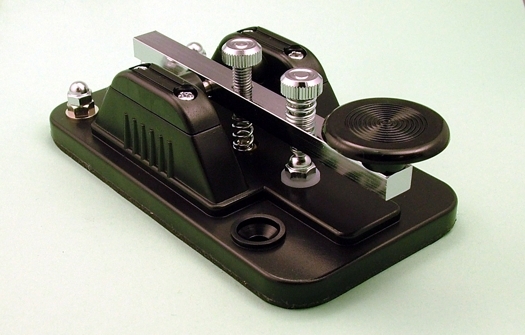 Since it has the same "knob-over-base" design as the 708, you can place it on your desk and use it without screwing it down or holding it. Perfect for mobile and portable operation, it's large enough that you can use it comfortably, but small enough to fit in a pocket. 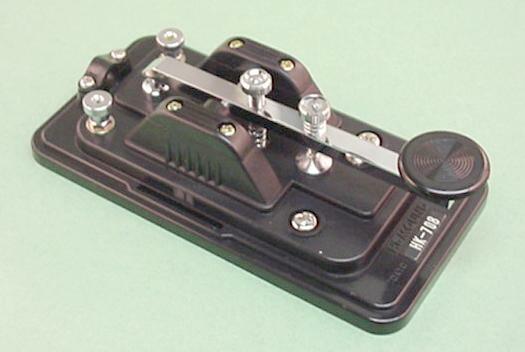 TC-701 Practice Key Ideal for the beginner, Hi-Mound's TC-701 is an HK-705 key mechanism with a code practice oscillator built into the base. 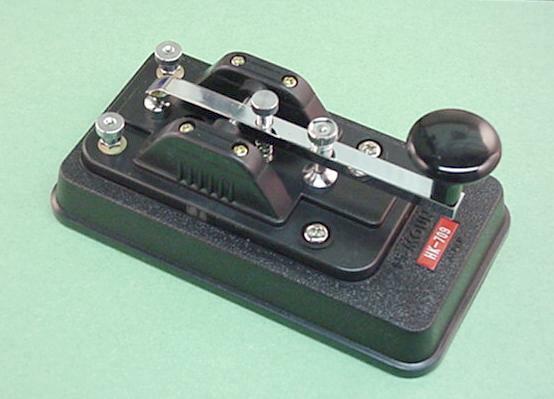 Unlike the vast majority of practice or training keys, the 705 mechanism feels just like a "real" key. 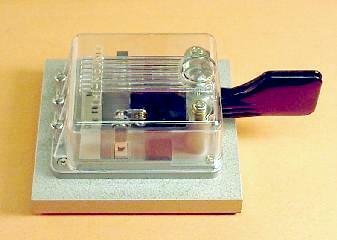 The oscillator will operate for hours on a single 9V battery (included). 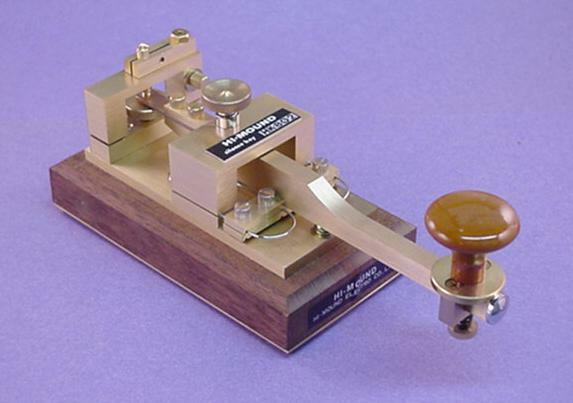 Hi-Mound's high profile (or "hi-rise") straight keys are perfect for sending using the British style, with the forearm in free space in front of the table. They can of course be used other ways (such as resting the elbow on the table). The mechanism is essentially the same as found in the low-profile keys, with silver contacts and permanently lubricated bearings. These keys come with high profile knobs (the classic mushroom shape) but the knob can be replaced with the flat 3/4" button. Base dimensions are larger, and the high-profile keys are slightly heavier than their low-profile cousins (except for the Deluxe 808, which is a much heavier key). Connections can be made to screw terminals on top, or solder lugs concealed in the plastic sub-base. 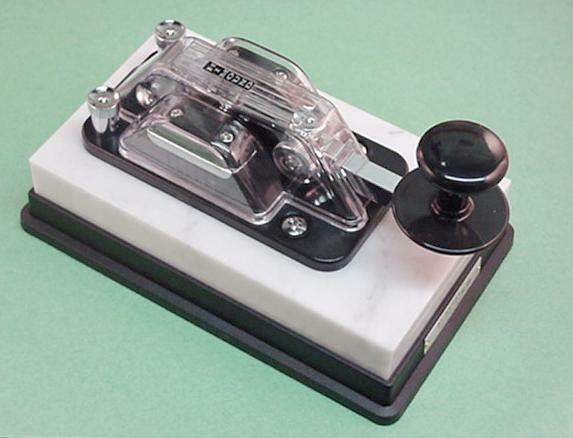 The Deluxe HK-808 key has a clear plastic cover and is mounted on a block of natural marble. Base dimensions are about 6" x 4" and the weight is two and a half pounds. Connections can be made to screw terminals on top, or solder lugs concealed in the plastic sub-base. 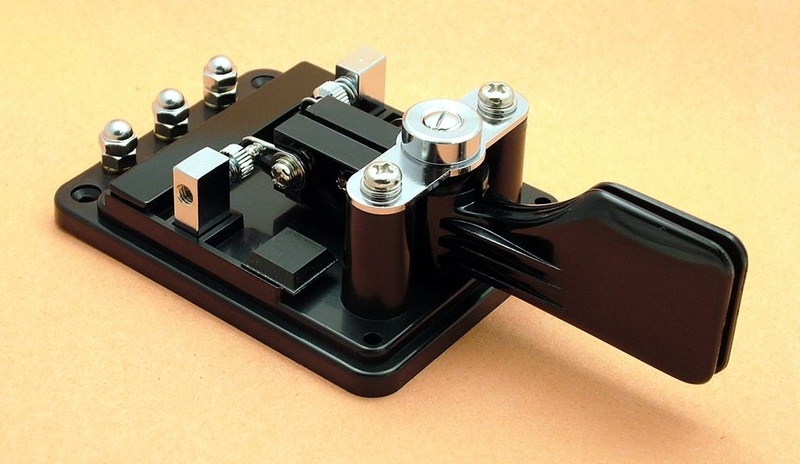 Identical to the mechanism on the MK-706 paddle (see below), the MK-701 is designed for putting on your own base or building into other equipment. Cable connection is by means of convenient binding posts at the back or solder lugs on the bottom The base measures 2-5/8" x 3-1/4:" and the mechanism weighs a mere 4 Oz. 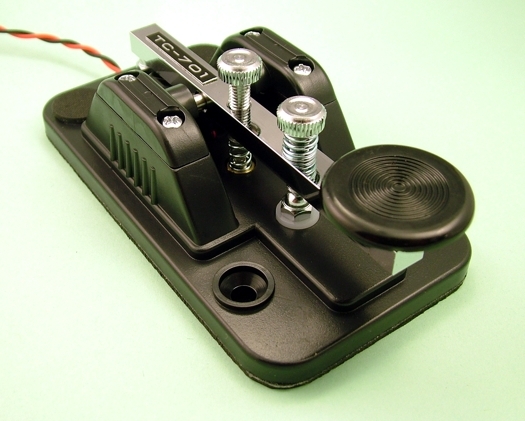 The classic MK-706 dual electronic keyer paddle is still only $139.95! This is a rugged, heavy paddle designed to give a lifetime of service. 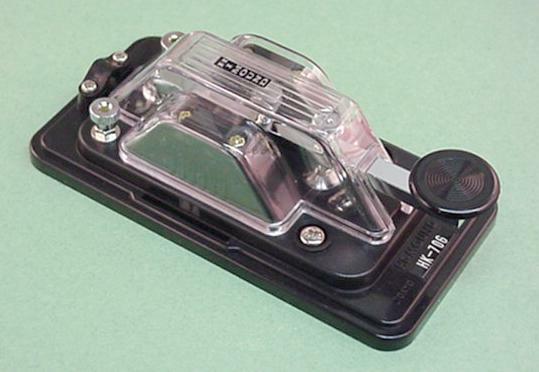 The MK-706 weighs a bit over two pounds, and the design is such that it seriously resists skating on the table. The action is very precise, with close-spaced paddles and fully adjustable bearing tension. The base is heavy steel, beautifully finished in flat black powder coat. (Older version was "Mouse grey.") 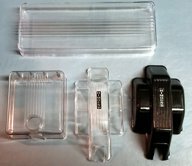 The plastic protective cover is included, and cable connection is by means of convenient binding posts at the back. click here for a look "under the hood". And click here for an unsolicited testimonial from a happy MK-706 user. Internal dimensions of the BK100C are 159x60mm. Hi-mound acknowledges that it is a tight fit and suggests adjusting it with sandpaper around the inside perimeter of the cover. Our preferred technique is to warm the cover with a hairdryer or leave it under a desk lamp for an hour or two. The problem is greater with older bugs which have settled a bit. The Hi-Mound knobs (HKK is shown above) will fit all Hi-Mound keys and others with Metric #4 (4mm) thread. HK-802 "Swedish" Key Based on the classic "Swedish Pump Key," the HK-802 was the presentation quality flagship of Hi-Mound keys in the 1990s, and perhaps the ultimate expression of the keymaker's art. These are BIG keys-- the overall length to the front edge of the knob is 8", the height is 3-1/4 inches, and the HK-802 weighs just over TWO POUNDS. From the striking design and beautifully finished brass to the polished hardwood base, the heavy 802 is bound to become an heirloom. And it is a dream to operate. The secret is the massive key lever, which is perfectly balanced and completely adjustable (even the position of the knob on the lever!). The instant you try this key you will realize that it is something special-- to quote N4XY "What a beautiful key! And it feels as good as it looks! I have never felt a better action in a straight key!" As you would expect with such an expensive key, there is considerable attention to detail. The brasswork on the 802 is superb, and there's room on the side of the base for a brass plaque with your own callsign (or someone else's for the ultimate gift or award). The HK-802 was discontinued in 2000.
ahead of some very well made and higher priced units. 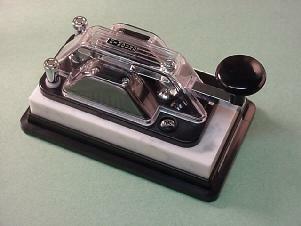 Just to let you know I love that iambic MK-706 I bought last week. Beats the pants off my Bencher and is much easier for me to send with ! I'm sold and would advise anyone to get one! Thanks Marshall ! Next..... that Swedish Pump <grin>. 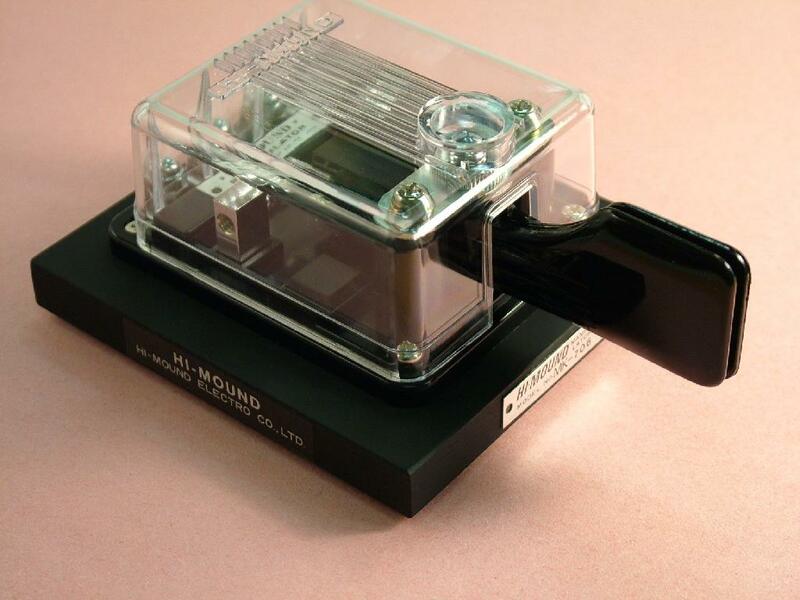 If you are a user of Himound equipment, your comments could be here!